A man from a different time, a different era. 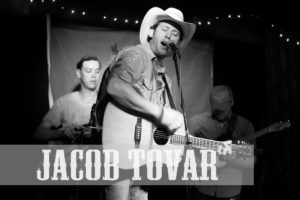 With a gentleman’s handshake, booming voice, contagious smile, and quick wit, this Tulsa, OK performer effortlessly connects with all through his sincere Roots Country songs: a weaving of Americana, folk, and old school country styles. Jacob grew up in Western Oklahoma working with his family’s business and appreciating many walks of life through the lens of a country lad. He has performed shows with the likes of: Chris Stapleton, Junior Brown, Sturgill Simpson, Wayne the Train Hancock, and many other Tulsa icons and legends! You can catch him almost any night of the week playing or taking in live music in the Tulsa area, continually connecting with the close-knit scene there.